Kemner foundry is a company with a long tradition and is open to new developments. Founded in 1969 by Ben Kemner in Leiden and continued in the Suburbs by three brothers: Andy Baldwin and Noud Kemner. After many renovations, the last major expansion in 2008. 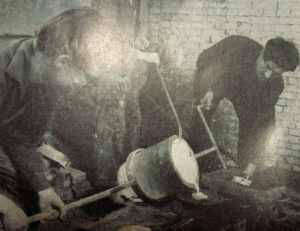 The foundry is now the only one in the Netherlands specialized in the three most common methods of casting art castings. With these methods we cast sculptures in bronze, aluminum and brass. We also provide castings in various other metals, including iron. The cire perdue method for, among other things, the direct Moulding of images in wet clay. The ceramic shell method for detailed images up to 70 cm. And sand casting method for large and small beautiful simpler forms. We can also assist you in realizing your artwork, from making fixtures to create a foundation, places, transportation and maintenance. Here we sometimes use the knowledge of other specialized companies we work with for years. Through years of experience we can advise you in making the right choice, for example, a pedestal or patin for your artwork.